I had this hand woven ikat fabric in navy blue colour with black stripes and small white lines on it. The fabric by itself did not need any embroidery on it. while going through a book of traditional Indian designs, I came across some geometrical designs, which I thought might go well with this fabric. 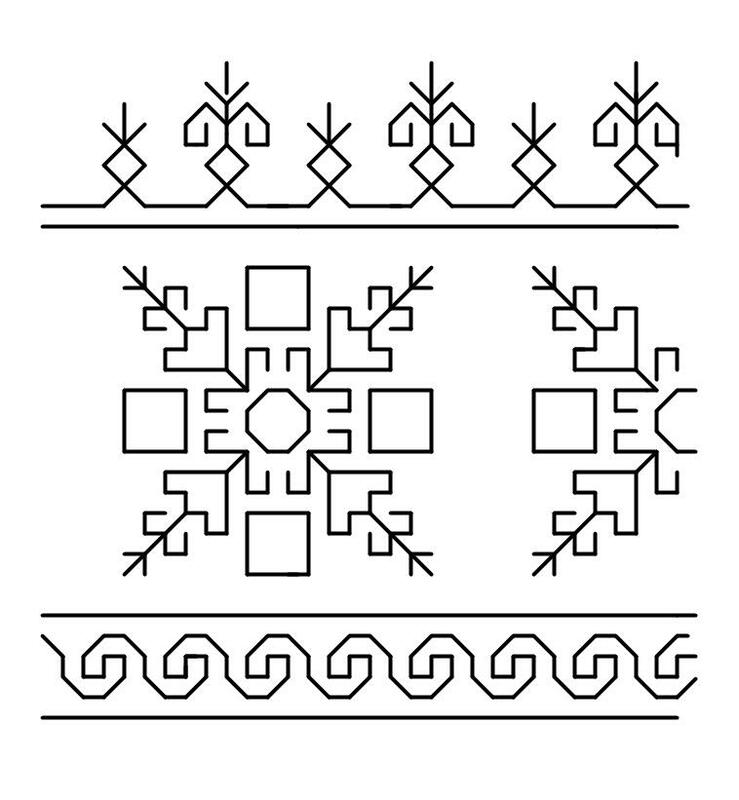 So I drew a yoke pattern based on some of these designs with my twist. 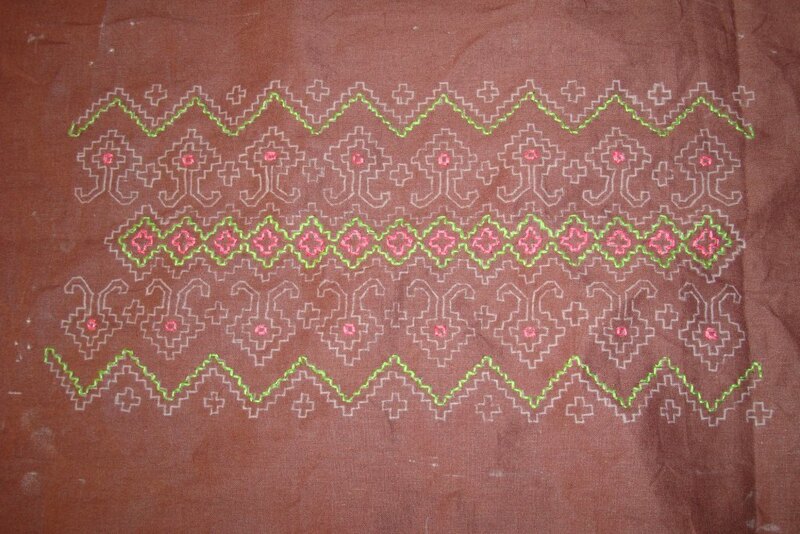 This pattern was traced on to a dark pink mangalagiri cotton fabric with stripes .the whole embroidery was done in double running stitch and back stitch with two strands of white cotton skeins. 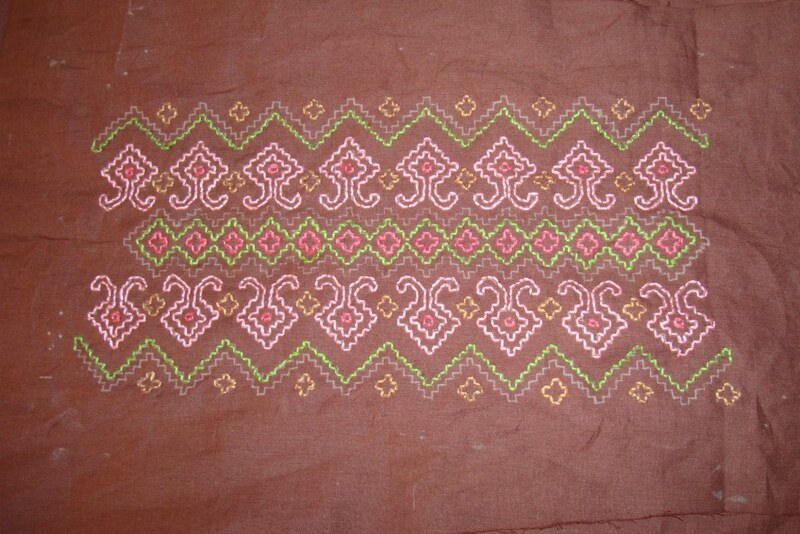 This work can be categorized as kasauti embroidery. The tailor used the same pink fabric as sleeve border. I like the neckline. The pattern can be used for phulkari embroidery by filling the shapes and the same pattern can be worked on a larger scale too. 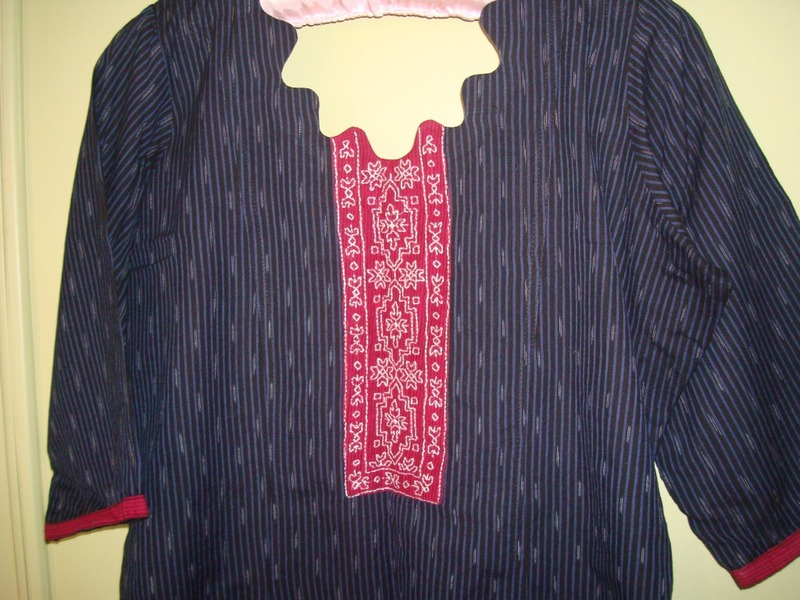 The kasuti yoke was completed after working with light green thread. 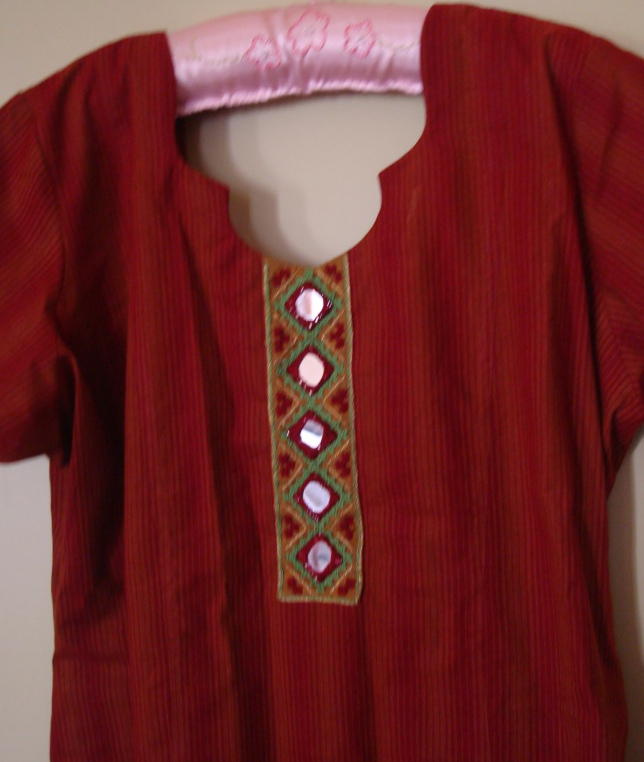 This tunic was inspired by chikan work tunics which are widely available in India. They come in pastel colours with chikan work done in the same colour of the fabric or more commonly in white. I wanted explore the effect of kasuti embroidery on a tunic. I am happy to see people interested in this work. 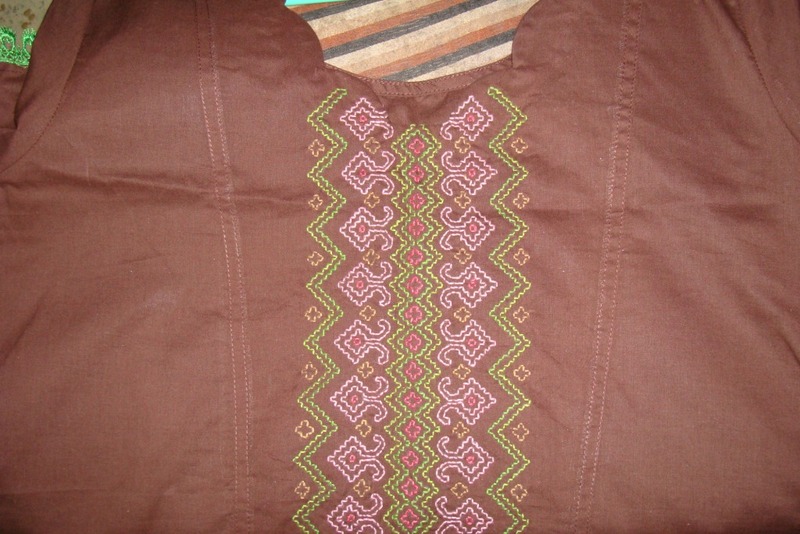 I wear this tunic with a printed[in green, white and brown] readymade Patiala salwar. This yoke is embroidered with double running stitch . this pattern is made of three broders. The outer border is also worked with medium green, leaving space for light green. 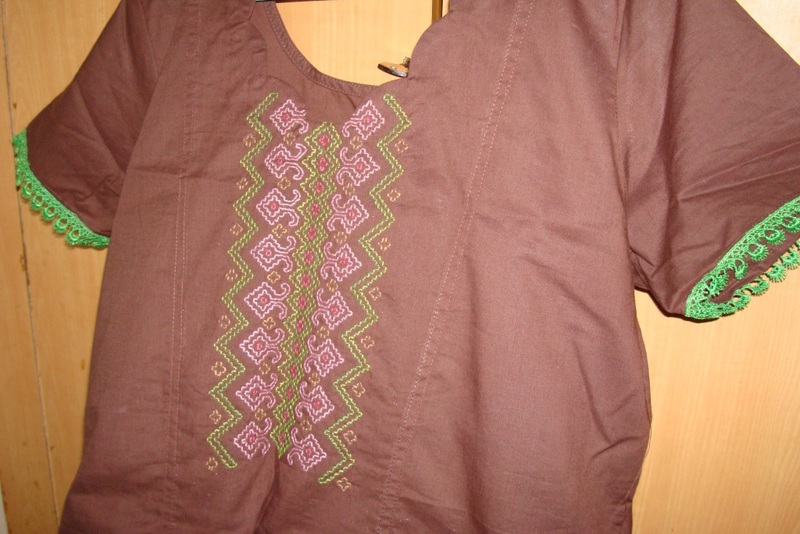 This plain dark brown tunic was a soft cotton fabric. idael for hot climates. I wanted to do some embroidery on the tunic fabric itself. For this a pattern was drawn for yoke. this was based on kasauti embroidery from Karnataka, a state in India. 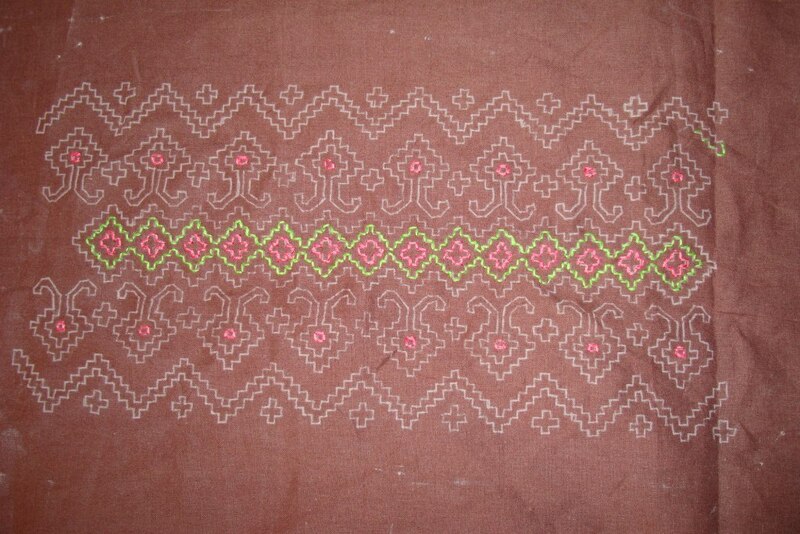 In Kasauti or kassoti embroidery,The geometrical patterns are worked with double running stitch. 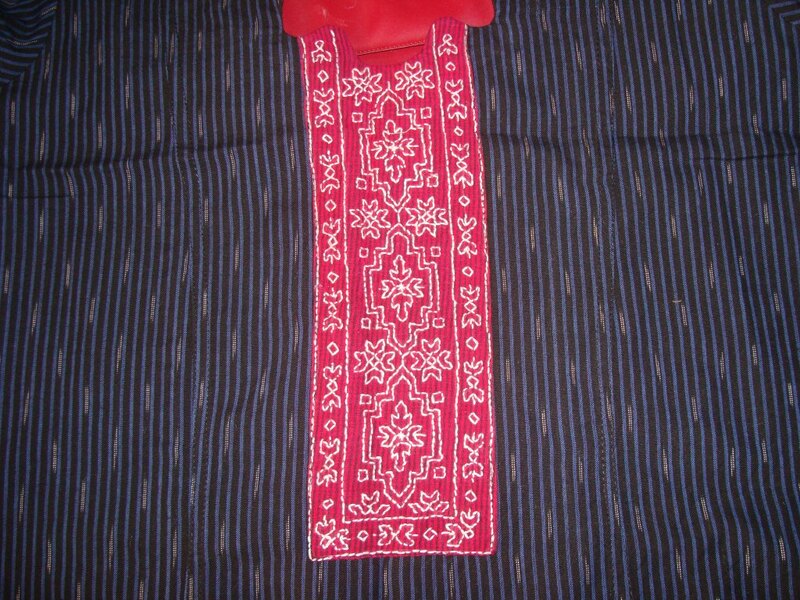 This way, the right and the wrong side look the same, ideal for sarees, dupattas, scarfs, stoles. Where the wrong side of the fabric is also visible while draping. 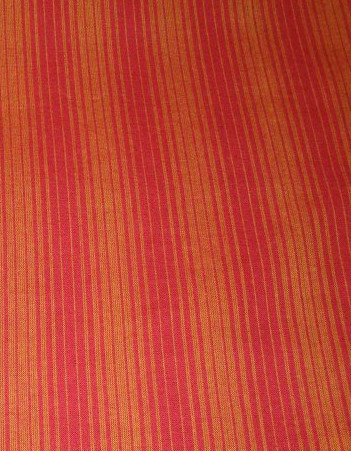 They are also worked on even weave fabric s which are used as furnishings. 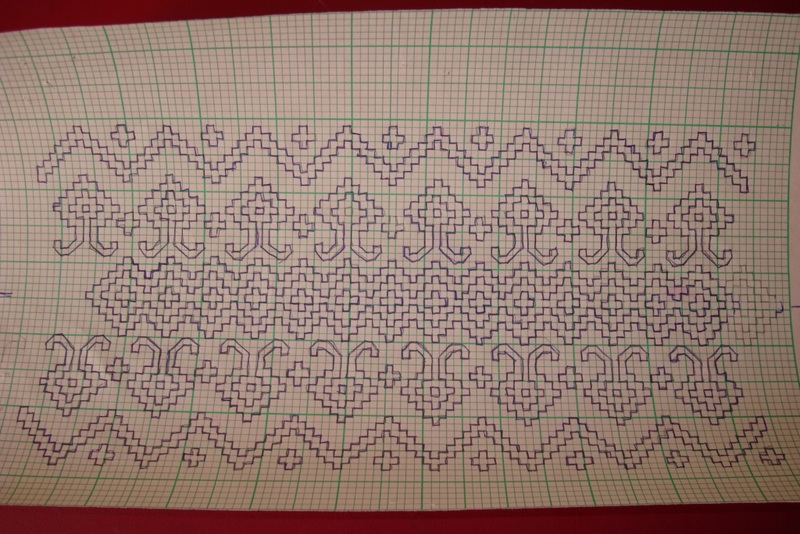 To make this method possible, care is taken at the level of drawing the patterns . 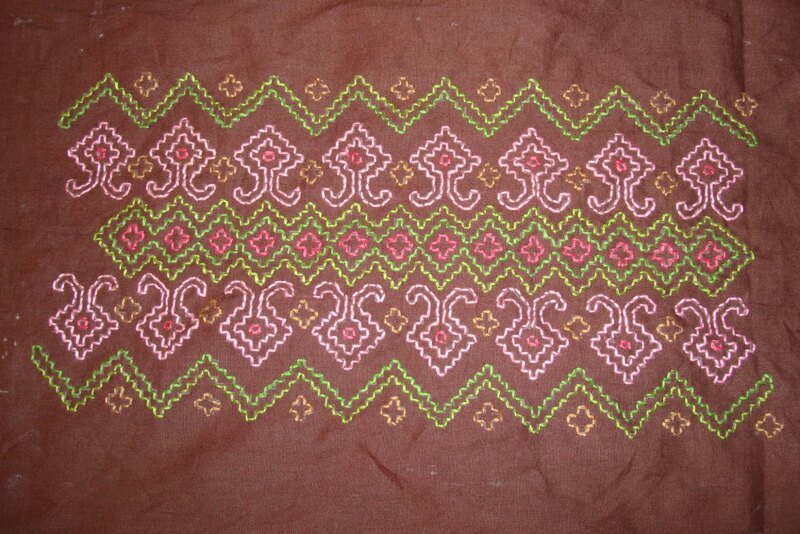 This yoke pattern is one such kasauti pattern. 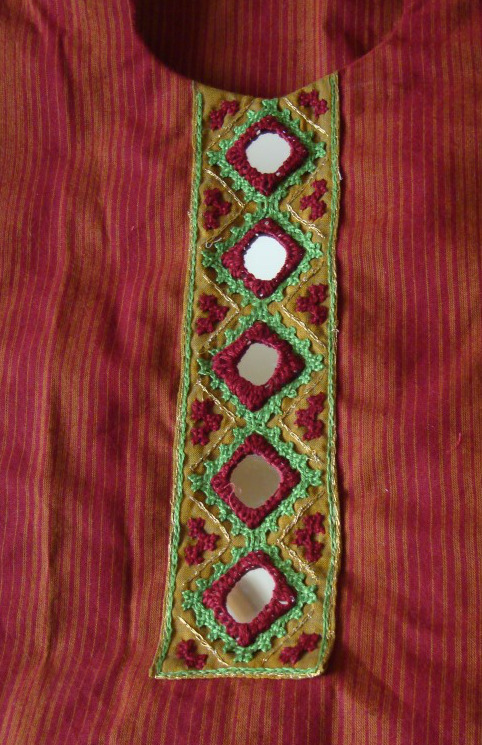 Golden yellow,,two shades of pink and green were the colours used for this embroidery. I started with medium pink thread and moved on to medium green thread.